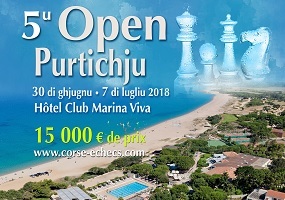 The Purtichju Open is a 9-round Swiss tournament taking place from 30 June to 7 July 2018 at the Hotel Club Marina Viva in Purtichju, Corsica, France and is organised by the “Echecs Club Ajaccien” and “Corsican Chess League”. Players receive 90 minutes for the entire game, plus a 30-second increment starting from move one. Draws by mutual agreement are forbidden.